The Ohlsen homestead features over 100 food and medicinal plants, and captures hundreds of thousands of gallons of water. This is the third in a Q&A series with longtime Bioneers community member Erik Ohlsen. To learn more about Erik’s work and approach to permaculture and activism, check out the links to other posts in the series below. One of the main principles of permaculture is that the problem is the solution. Can you cite an example of how you use that principle in your personal or professional life? In the landscape we do it every day. For instance, you have a lot of people out there, folks who have money, who want to put in landscapes. They want beauty and aesthetic, and to walk around their home and landscape and be in awe. One of the ways we’ve leveraged that aesthetic need is by developing a design service through Permaculture Artisans that meets the aesthetic needs of clients while at the same time almost seamlessly and unnoticed, if necessary, developing massive water harvesting systems, carbon sequestering plant soil-building systems, and sustainable forestry systems for clients with a forest landscape. Last year the market for landscaping was $72 billion in the United States, much of which is lawns and high-end landscapes. We identify the land-use problem — the way people design and build landscapes in a non-ecological way — and turn that into a land-use opportunity. We are seeing a change in a trend in the way people are looking at landscape, especially as the effects of climate change hit hard in California and other places. Often people think, “Well, I guess I just need to have nothing; I need to have xeriscaping or all drought-tolerant plants,” and while these could be great ways to save water, you can also have a bigger impact by not only having water conservation, but also actually harvesting the water that does come and being able to create abundance from that. while we are in a drought, we need to frame it a bit differently and understand that one of the things we really have is a runoff crisis, and that’s something that we have the ability to do something about. If we adjust our view of the drought in California, we can see a lot of opportunity to start developing real water resiliency in our communities, and in our landscapes. That leads to people calling us because their wells run dry and they need a rainwater catchment system. They don’t have any knowledge of permaculture, they’re not necessarily ecologically minded, but their well has run dry. That’s what gets them started. Once they go down that road and we start designing and installing water harvesting systems, then we say, by the way, if you plant these plants, you will be harvesting lemons every day, you’ll have Monarch butterflies visit you. So we can start turning people on to biodiversity and local food production. That really came out of this crisis moment. “The problem is the solution” is almost like an aikido approach that will really help move the needle from degenerative consumption and degenerative land use towards locally-based production and consumption. When you go to a site, how do you read the landscape to understand what that land wants and what’s possible there? The first thing that I do is try to erase any knowledge I have of anything. I don’t believe all permaculturalists do this, and it’s something that’s sort of a quality approach that some of us are working on. When we go to a new site, we don’t want to walk in there and impose our idea of what it should be. I want to be as open and curious as possible as to the patterns I see on the landscape, the natural history we might tune into, and looking at things like topography, plant species, density of trees, and where structures are placed. Those are all landscape elements that we want to be open to, just observing the patterns. In a usual consultation, the first hour that I’m there, I’m not trying to provide any suggestions, unless I see something that is just glaring. I’ve saved clients tens of thousands of dollars just in the first hour on a site because they were doing something so degenerative that it was pretty obvious to see that a catastrophe was upon us. But more often I try to just listen for the first hour. Not only do I assess the landscape, but I’m also really assessing the client, because ultimately if a client is going to invest in some sort of intervention on their landscape or they’re going to install something or do something there, we really need to understand where it’s coming from, what their goals are, and what they need. We really want to start at the high level in terms of how the landscape can really meet their lifestyle and help accomplish the dreams they have for themselves and the space. Then once we gather enough information, both from a physical and social point of view, we can start to make some suggestions. 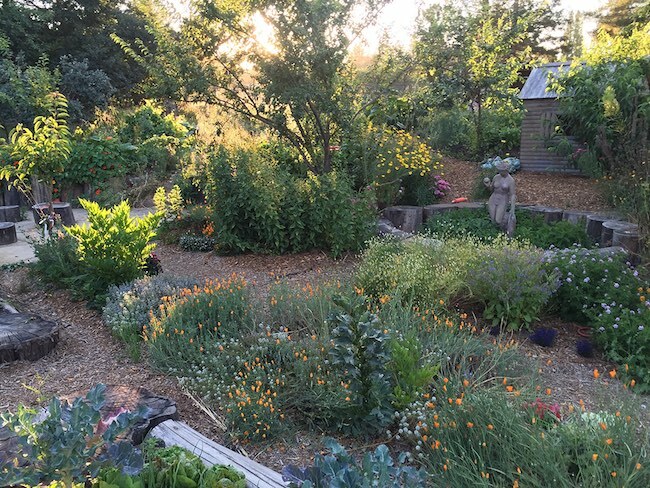 Sometimes you have clients who are not necessarily into doing a full-on ecological-food forest-landscape-permaculture-type thing; they just want to have something beautiful and they need water in order to do that. So we look for the entry point, the main goal that the client’s going for, and then we leverage that to support some of the more ecological solutions. I honestly believe that in this work and in my company it’s more important to focus on relationship than it is to focus on the final product. I’ve built both of my companies on this principle. At times, I’ll have clients who have no ecological literacy whatsoever, but because I treat them with such love and respect, they consider me like family. When you can build a relationship with somebody where it feels like family, you’ve built up a kind of trust where they have an openness to learning a little bit more, getting more ecological literacy, and then they want to do the right thing. Sometimes I feel like part of my job is just to build relationships with folks and start to support them in what their needs are so that they have openness to the kinds of ecological solutions that we’re providing.